In Yellowknife, at the peak of summer, the sun doesn’t set. It merely sits on the horizon, creating twilight for 4 to 5 hours, then it rises again. This lasts for many days, not only for the longest day of the year. So Yellowknifers take full advantage of the extra hours of sunshine, and are active outdoors for as long as possible. In early June, in order to enjoy the outdoors to the max myself, I decided to join the boys and girls of summer and try my hand at playing baseball, the slow pitch version. By then, the league games had already been underway for about 2 weeks and, having never played before, I wasn’t sure whether any team would want to take a chance on a novice. But I figured it was similar to cricket and rounders, and that anyone who has played any of the bat ball games should be able to play another. At least I could still remember how to hit a ball. One of my co-workers was in the league, so on a Friday at 4:30pm, I casually asked him if he knew of any teams looking for another player. In typical Yellowknife style, first thing on Monday morning there was an email from a team captain in my inbox, saying they could do with another female player. I warned him that I had never played before, gave him a last chance to back out, but he replied that I should show up with my glove for a game the next day. That’s when it dawned on me: you need a glove to play baseball. At lunch time I popped over to Canadian Tire and, faced with a plethora of gloves, of various sizes, materials, right-hand and left-hand, I was instantly overwhelmed. The only store assistant that I could find was from the Philippines, who told me that he had never played baseball, so he was as clueless as I was. A quick phone call to my co-worker sorted out that I needed a glove for my left hand. Good thing, because I would have bought a right-hand one, since I’m right-handed. The other selection criteria were up to me, so I chose a glove that I figured I couldn’t go wrong with: something in pink. 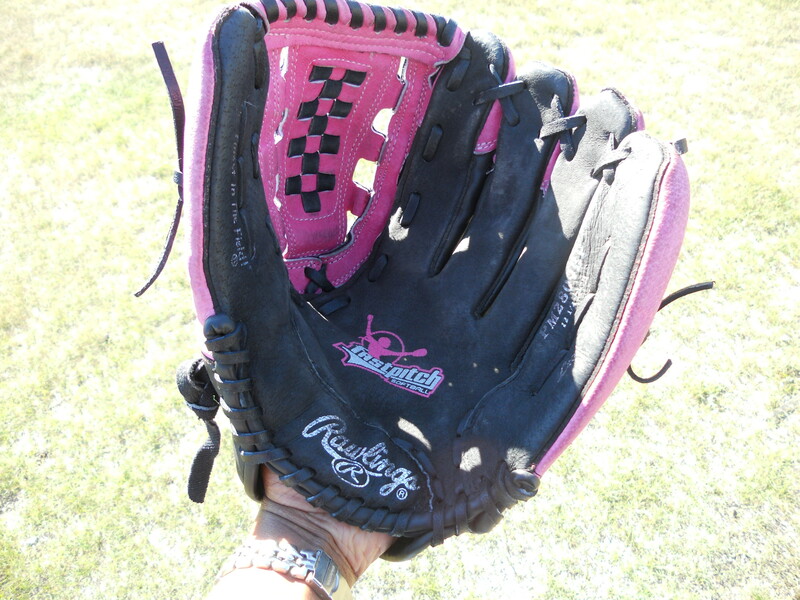 Tuesday came and I showed up at Parker field with my brand new glove, which some of the ladies admired and considered to be rather stylish. (Well, if you don’t know how to play, you can at least look good.) The game started at 9pm, a testament to how late the sun stays up. My team was called the Court Jesters, I’m guessing because it started off with players from the Ministry of Justice. The opponents were up to bat first, and I was assigned the position of rover, in the field between the shortstop and the outfielders. Wearing an ungainly glove felt like a handicap, wearing it on my left hand felt even more awkward, but I took comfort that if I didn’t catch the ball, there were players behind me who could. In the outfield I couldn’t hear much, but the umpire occasionally yelled something, which was the equivalent of getting the cricket score live. What I didn’t factor in was that it was mosquito hour, and the swampy land behind the field didn’t help. So my first inning was spent swatting mosquitoes in style with my glove, and praying that nobody would hit the ball my way. Being accustomed to cricket and rounders, where a team bats until all players are out, or until the stipulated number of balls have been bowled, our turn at the bat came sooner than I expected. Slopitch rule #1: 3 players out and you’re done. I then understood how baseball games can be completed in an hour and a half. My turn to bat arrived, I picked the lightest bat and, despite not having handled a bat of any kind in years, I managed to hit the ball. I found it harder to control where the ball went when hitting it with a round bat, as opposed to the flat cricket bat and rounders pallet. My next challenge was remembering to drop the bat. I ran with it the first couple of times and the umpire had to remind me to drop it. Once I must have thrown it too hard behind me, because the catcher wasn’t too pleased, and quite vocal about it. My biggest confusion was over the rules on when to run. Baseball is a landmine of rules, and apparently each version of the game has its own. In slopitch, if only one teammate is out, you can’t run if the batter hits a fly-ball (i.e. up in the air), unless the other team doesn’t catch it. But by waiting to see if they drop it, you practically guarantee that you won’t make it to the next base if you have to run. If two players are out, you can run the instant the batter hits the ball. All these rules have created additional employment, for coaches who stand at 1st and 3rd bases, purely to tell you when to run. In short, it’s absolutely not cricket, nor rounders, where you have to figure that out for yourself, and if your judgement was bad, you find out soon enough. Back out roving in the field for the next inning, much to my dismay, somebody had the temerity to hit the ball towards me. My instinct was to try to catch it with both hands. It hit my glove, which was still newly stiff, bounced up and hit me in the eyebrow. Some people call the game slow pitch softball, and the ball is light, but it’s not soft. So it’s a good thing that it’s not really pitched as in fastpitch or professional baseball; it’s more like gently lobbed at the batter. But if it gets blasted off the bat by a guy with bulging biceps, it sure can hit you hard! I didn’t know if it was blood or water coming out of my eye, and for a split-second I couldn’t see clearly. My teammates asked if I was okay and I was, shortly, but my eyebrow smarted for quite a while. Play continued, but that marked the start of my baseball injuries, and my troubles with catching. At our next game, a ball was hit along the ground towards me and it missed my glove and ended up whacking me on my inner ankle. That hard ball left me with a sore ankle for the rest of the game. To add insult to injury, our opponents must have realized that I was the weak link – that I couldn’t catch to save my life – because after that it seemed to me that many balls were aimed in my direction. I consoled myself that even some of our experienced players occasionally missed their catches too. No surprise to me; who invented that clumsy glove anyway? Other teams usually razzed each other, but there was never any of that on my team. Perhaps they quietly recited prayers every time the ball came my way, but the only words ever uttered to any teammate were of encouragement, no matter what happened, be it in our favour or not. Having dropped catches, struck out, and run when I wasn’t supposed to, thus ending our inning, I’m lucky to be on a team with such good spirits. By the end of my third game, my injury score was 3 for 3, in spades. My teammate hit a fly-ball and when the opponents dropped it, I had to pelt over to 2nd base. While accelerating from 0 to 60 in 5 seconds, I pulled a muscle, an inner thigh muscle, one that I didn’t even know I had. In a later inning I pulled the same muscle on the other leg, and by the end of the game, I had pulled all remaining muscles, in both legs. I had to lift my legs into the car with my hands. Even lifting my foot to press the pedals hurt. I limped up the stairs at home and after a painful hour or so, it was clear that I had to do something, or I might never walk again. So I limped back downstairs, lifted my legs back into the car and hobbled into Shoppers Drug Mart to seek relief. Once again, I was faced with a glut of products. I bought the most extreme, ultimate, exponentially maximum strength Rub A535 liniment that I could find, and hobbled back home. It was one of those moments in life when you realize that you have become one of your parents. I remember my father occasionally suffering a pulled muscle, and rubbing on liniment from an ancient dark-blue bottle, with a label so worn that it was illegible. I used to think that it was the most foul-smelling substance on the planet. But in my youth I never knew the pain of a pulled muscle, let alone multiple pulled muscles. My muscles were generally pain-free in the era BB – Before Baseball. The instant I smelled that pungent odour I thought of my father, wondering how he could stand it, but when, 15 seconds after application, I could walk straight and pain-free again, I understood. 3 days later I was like new, in perfect time for our next game. We have played many games since then, against opponents with such intimidating names as KFC Nuggets, Great Slave Dental Cavity Crushers, Quality Furniture Sofa Kings (whose motto was Sofa King Good) and The Northern Disasters, among others. With practice, my catching skills have improved – slightly. Nobody was more surprised than I was when I actually caught the ball at 3rd base in one game. But those dastardly rules: I had no clue whether I had to also tag the runner, or the base, so I did both, to ensure that the runner was out in every way possible. The fact that he collided violently with my shin was likely why his team selected me as MVP for that game. I say that because I hadn’t made any runs and I’d even struck out once, so to this day I don’t understand the voting criteria, but I decided it was best to keep my mouth shut. The slow pitch baseball playoffs are in progress now so it’s nearing the end of the season, and my team was recently eliminated. But, thanks to the kindness of a teammate who took it home and softened it, my glove is now a bit more broken in – as is my body. I have experienced the disappointment of striking out, and the adrenalin of running hard for home as my teammates cheer. I have also learned many things: to drop the bat before running, not throw it, because the catcher might yell at me; that I can quietly sneak home while all attention is on the player running to 1st base; how to keep score; when not to run; that a teammate can run for me if I pull a muscle; to stretch beforehand to avoid pulling a muscle in the first case; and to not leave my shins in the way of grown men who are running at full tilt. Baseball certainly isn’t cricket and it’s not quite rounders either, but it definitely is a lot of fun. I have 9 months to stretch my muscles for next season. Hilarious! A-535, bruises, pulled muscles, colliding, all the different rules..all part of the game that no one really discusses but is a part of the game. Well told. Like, like, like! Thanks Tamara. You’re the biggest fan of the game that I know, so why am I not surprised that you like it? 🙂 Come and play up north next year! Haha, that would be awesome! Yes I love this game! You sound like you’re having fun despite the war wounds!